TestMaster® Model 64 Series Hydrostatic Test Tool with 90° Angle Port. 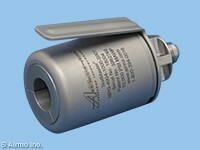 TestMaster® MPG Series Gas Test Tool for Helium or Nitrogen. TestMaster® Hydrostatic Test Tools for Pressure Testing Tubes and Aircraft Assemblies. NuQuip® Quick Disconnects with Working Pressures to 60,000 psi (4,137 bar). 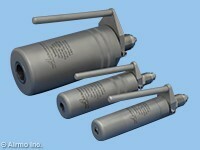 NuQuip® Air-Bleed Valves Routinely Bleeds Air Entrapped in Assemblies. AIRMO INC. PRESSURE TECHNOLOGIES is a global supplier of non-destructive and destructive test systems and test tool solutions for analyzing tubes, pipes, and assemblies used in the aerospace industry. TestMaster® Tools provide a safety pre-grip and positive sealing on plain end tubing for hydrostatic pressure testing, air underwater testing, and cleaning applications with working pressures up to 40,000 psi (2,758 bar). The tools are available with either a manual hand level or pneumatic air-actuation. TestMaster® Tools offer standard and metric tube and pipe sizes from 0.08 in. to 6.63 in. OD (2.0 mm to 168.3 mm OD). The tool's compact, balanced design is suited for restricted aircraft work areas such as hydraulic or fuel line locations. A variety of services can be used for testing including air, water, oil, helium, nitrogen, Skydrol, and other gases and liquids. 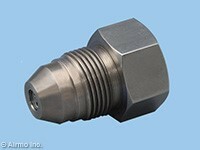 The low-marking collet design prevents tube end collapse, eliminates scrap, and avoids rework. NuQuip® Air Bleed Valves and Quick Disconnects integrated with test equipment saves the machine operator time during the fill cycle and tool changeover. 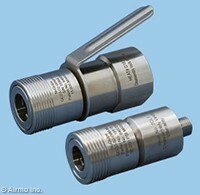 High-pressure accessories are available with working pressures to 60,000 psi (4, 137 bar).